The school/Kindergarden project - cruzinhas Webseite! Nursery and primary education provide fundamental building blocks for a better life. 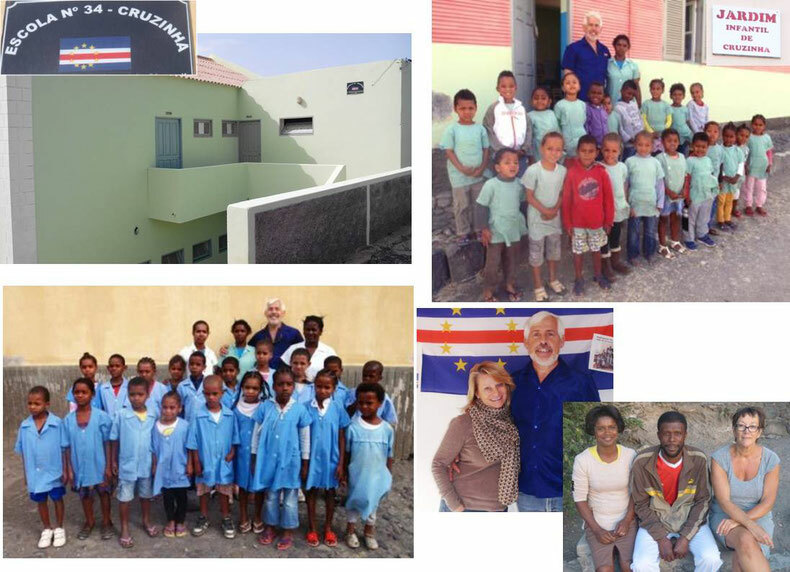 The villagers of Cruzinha on the western most Cap Verde Island of San Antao give their almost 100 children a head start by running a small nursery and primary school. A small group of teachers care with great enthusiasm and deep commitment. The federal and the local community do not have sufficient financial resources to fund all necessary improvements of the school building, buy teaching materials or provide school meals, allow post school formations. The "League of Friends of Cruzinha" is a private initiative to support this local project by donating materials and funding various necessary improvements. At present we provide teaching and learning materials on a yearly basis and also finance necessary renovations and extensions. In 2016 we start to finance/co-finance post school stages and formations. With your one- off or regular donations you will help us to guarantee our continuing support. We produce annual accounts and also visit Cruzinha once a year in order to coordinate and plan projects. Soon we will beginn to expand the scope of support to build up local tourism, that may offer employement opportunities for the village and earning options for fishing and farming. The island is blessed with georgous nature, year around pleasant weather and a wide range of vacation options. 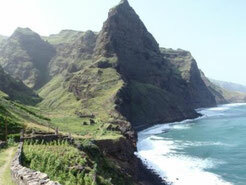 The famous St Antao West Coast Trail starts/ends in Cruzinha. Nice hiking trips - few hours to day long - lead to unforgetable memories of nature and people. Local guides can be hired to show you the best spots along the coasts or in the mountains, the daily life of farming and fishing, interesting spots of earlier volcanism. St Antao is connected with the island of San Vicente by ferries, several departures per day. 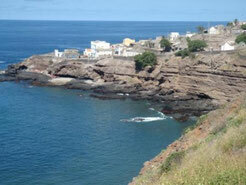 You reach the local harbor (Porto Novo) by local mini bus or private taxi via Ribeira Grande. We are happy to offer advice and help with planning your trip. The Cap Verde Islands are one of seven countries in the world which have been classified by the non profit organization Ethical Traveler as promoting development in accordance with the needs of the local population. Cruzinha da Garca is a small sea side village of 400 inhabitants on the north-west coast of the St Antao island. You reach it by car or local bus via Ribeira Grande. 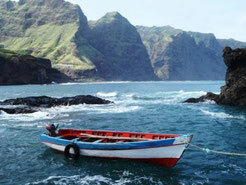 You may also hire a small boat in Ponta do Sol. Local food stores provide basics, fresh vegetables or fish can be purchased locally. Since 2012 mobile phone reception is available. Besides the famous WestCoast Trail (right column) Cruzinha is a great point for day trips along the coast and to the mountains. Because of the historical vulcanic background, spectacular views of lava / stone formations can be seen. After the short raining season end of summer the fields and mountains are colored in a bright green. Local guides can be hired, ask locally Miss Maria Helena de Cruz or Mr Pascoal Nicolacia. Diving is possible in Tarafall, south coast. This trail is a must for hikers and one of the most beautifull ones worldwide along a breath-taking atlantic coast line. You walk on a century old cobble stoned path (today well maintained) connecting the hamlets, deserted houses and fields. You pass 2 small villages, where you find food and drinks. Not recommended for small children and elderly people with physical handicaps. On the Internet you find several publications covering this great hiking option.